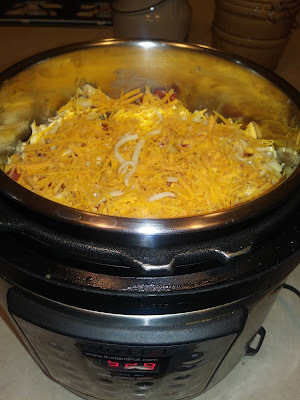 So many had suggested King Ranch Chicken for our family dinners that I thought of it when I needed something for the church potluck. I wasn't sure how much warming space the church had, so I made it ahead in the Instant Pot using the slow cooker function, and kept it warming through service. I found the recipe at Six Sisters Stuff. Check them out. How have I missed them? They have cookbooks and everything. LOL This worked well - though the chips on the bottom stuck - I'm sure due to the extended warming time. We were half-way through the potluck when I realized I'd brought something to a potluck which I'd never tasted. The kids assured me it was good and it was gone....so I'm guessing it was - or there weren't many options. ::snort:: I used the 6 qt pot. In a medium sized bowl combine the chicken, diced tomatoes, cream of chicken soup, cream of mushroom soup, chicken broth, garlic and onion. Stir until combined. Place half of the chicken mixture on top of the chips. Then top with half of the cheese. Cook on low for 4 hours or high for 3 hours. Serve with extra tortilla chips.